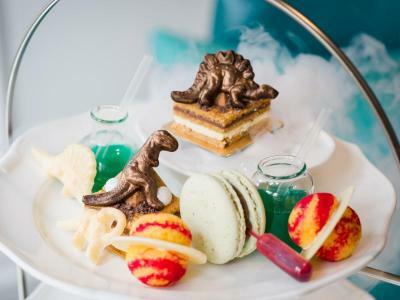 We invite you to our one-of-a-kind Science Afternoon Tea, combining unique flavour combinations with scientific quirks. You can expect a mix of exciting and curious dishes, from jellies served in petri dishes, to chocolate spacemen and dinosaur biscuits. This is paired with afternoon tea favourites, like scones, sandwiches and plenty of tea. Our inspiration came from our South Kensington neighbour, the Science Museum, just five minutes from our front door. Here, they experiment with sounds and visuals, making each experience interactive. We wanted to do the same with our afternoon tea. This voucher includes VAT and Service Charge. To arrange the date and time of your Afternoon Tea, please call us on +44 207 591 4414 or email us at drawingrooms@ampersandhotel.com. 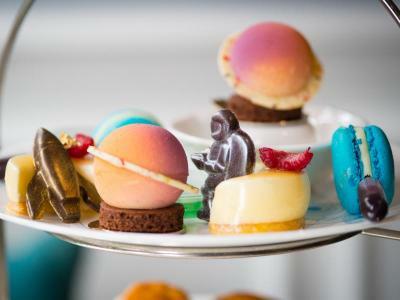 We invite you to our one-of-a-kind Science Afternoon Tea, combining unique flavour combinations with scientific quirks. This version is served with a glass of Charles Heidsieck Champagne. 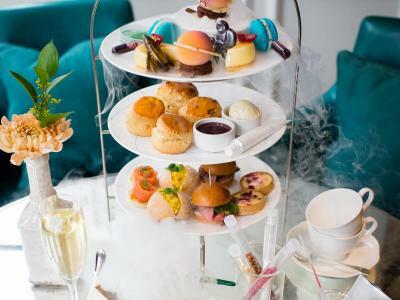 We invite you to our grown-up twist on The Ampersand Hotel’s famous Science Afternoon Tea. 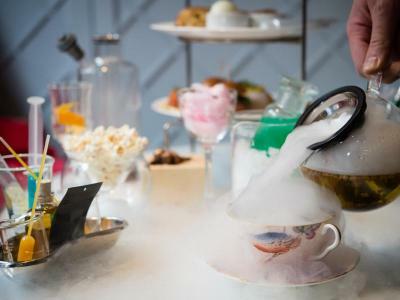 Our Science Teapot Tales, combine unique flavour combinations with scientific quirks and a flight of 3 cocktails. You can expect a mix of exciting and curious dishes, from jellies served in petri dishes, to chocolate spacemen and dinosaur biscuits. This is paired with afternoon tea favourites, like scones, sandwiches as well as the all important flight of cocktails. The inspiration behind the tea comes from the Natural History and Science Museums. Here, they experiment with sounds and visuals, making each experience interactive. We wanted to do the same with our afternoon tea. Teapot Tales are available from 12:30pm-9pm Thursdays, Fridays and Saturdays.